In the United States, the social safety net is composed of more than 80 services that together aim to lift almost 50 million Americans above the poverty line each year. Today, tens of millions of those people are still falling through the cracks. Imagine you are a single parent whose hours were unexpectedly cut. You were struggling to make ends meet while working full-time and now you’re very worried. You have rent, bills, and other basic needs to cover and you know you won’t be able to now. Access to both food assistance and healthcare is huge— while it may not solve for all concerns, having that assurance that you can provide food and healthcare for your family can help ease the burden while you come up with a plan. For many people, the process of applying and maintaining benefits is complicated, time-consuming, and lacks clarity — leaving people to navigate a system with numerous barriers that push them further away from basic needs, like food and healthcare. We need to break down these silos and demonstrate approaches that are easier and faster for clients and more effective and inexpensive for states. 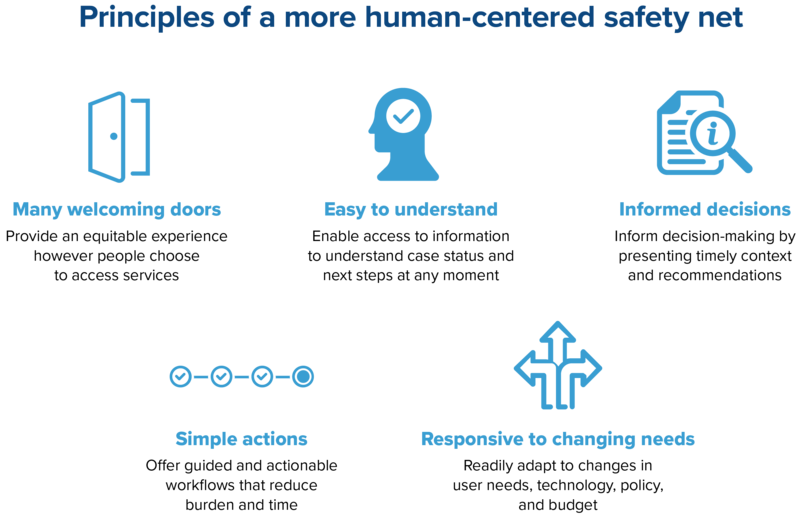 The Integrated Benefits Initiative leverages technology and design to demonstrate a more human-centered social safety net that enables access, improves efficiency, and promotes integrity. To achieve this, Code for America partnered with the Center on Budget and Policy Priorities, and Nava Public Benefit Corporation to conduct pilots in Michigan (in partnership with Civilla), Colorado, Alaska, Vermont (led by Nava PBC) and Louisiana. A human-centered social safety net guarantees that the needs of clients are put first. It ensures that when individuals or families need help, it is easily accessible. It provides clarity when there is confusion. Most of all, when someone applies for benefits they are met with relief rather than friction. After kicking off our first pilot in Michigan, residents now have access to a more streamlined application process for SNAP and Medicaid, which results in a faster approval process. This online application takes less than 10 minutes to complete and has assisted over 2,000 people since the pilot kicked off. We are redesigning how people access social safety net benefits in states across the country. Strategic field research. We conduct state-based field research to help agency leaders dig deep into the programs they manage, uncover new opportunities, surface the challenges that caseworkers face, and identify the evidence-based paths toward truly integrated benefits delivery. Pilots. Based on the findings of field research, we will rapidly prototype open-source tools in partnership with state agencies. Each prototype will seek to catalyze a more human-centered design of benefit systems. Special Convenings. To share our open source software and the insights our work generates, we will convene leaders across local, state and federal government to build connections and leverage what works. These principles represent Code for America’s vision for the Integrated Benefits Initiative. The principles are intended to describe outcomes of an improved system where the user experience and user needs are placed at the center of what and how we build. User needs reflect those of clients, workers, and state and federal leaders while outcomes enable all relevant characteristics of the system—people, processes, IT, and policy—to meet those needs. Want to learn more about the Integrated Benefits Initiative? Watch the video. Support is provided by the Chan Zuckerberg Initiative, helping shape a world that is just, inclusive, and full of opportunity for all people. Additional support is provided by the Walmart Foundation and the United States Department of Agriculture Food and Nutrition Service.